Announcement All my Greeting Card Sets are designed so they can be sent via US Mail for a single stamp. Envelopes are always included and already have a Forever stamp on them, so no trips to the post office for a stamp! I rarely make the same card or set of cards twice, though I often make a variation on a theme. 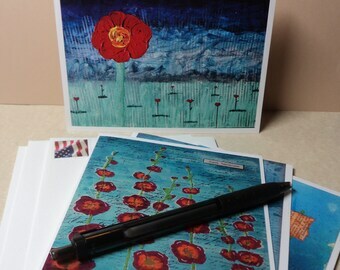 All my Greeting Card Sets are designed so they can be sent via US Mail for a single stamp. Envelopes are always included and already have a Forever stamp on them, so no trips to the post office for a stamp! I rarely make the same card or set of cards twice, though I often make a variation on a theme. I really like these..I know I will enjoy using them while learning..they arrived well packaged and delivered early. Welcome to my shop! I specialize in cards; all various kind of cards. I have greeting cards, post cards, and perhaps a set or two of Divination Cards. Browse. Enjoy. If your cards arrive damaged, please contact me for replacements or refund. Refunds only issued in case of damaged product. I prefer PayPal for payment but any credit card will do. Thank you. I'm only currently shipping to US customers. I offer free shipping on most items. Items will ship via US Postal Service. Gift card sets fit in a flat rate box and smaller items like postcards and Divination cards will be shipped via First Class envelope. I do not make custom orders at the current time.